It’s official! Senator Manny Pacquiao has replaced Coach Freddie Roach as his trainer for his next fight. The eight-division world champion will now train with his long-time friend and assistant trainer, Buboy Fernandez. 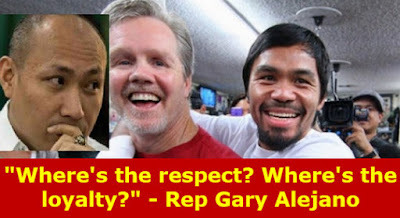 As a result, tons of boxing fans and personalities criticized the Filipino boxing icon, including Magdalo Rep. Gary Alejano. “Manny has told me Buboy (Fernandez) will be handling the training on this fight. What’s important to Manny is that he has one voice to listen to in the corner that he trusts, and that’s Buboy for this fight.” Michael Koncz, Pacquiao’s manager, Michael Koncz, told ESPN last week. Apparently, Roach was reportedly not informed about the change. "There was some concerns Manny had in the last fight and some statements Freddie made to the media that Manny wasn't very pleased about," Koncz added, without giving further details on why Pacquiao decided to drop Coach as his trainer. Nevertheless, he was referring to the Pacquiao’s loss to Australian boxer Jeff Horn in July 2017. Roach has been Pacquiao’s trainer for 34 fights since 2001, and Manny has been describing Freddie as his second father to him. Pacquiao (59-7-2, 38 KOs) will fight against WBA secondary welterweight champion Lucas Matthysse (39-4, 36 KOs) on July 14 in Kuala Lumpur, Malaysia, to be promoted by Pacquiao’s MP Promotions. Meanwhile, Rep. Gary Alejano said that Sen. Pacquiao was not being fair to Roach considering that the latter has helped him a lot in fulfilling his dreams, and becoming one of the wealthiest athletes in the world. According to the Liberal Party (LP) ally lawmaker, Manny is starting to be blinded with dirty politics in the Philippines. “I understand that Coach Roach might have said something in public that hurt Sen. Pacquiao’s feelings. But is that enough to end your friendship, and not inform him that you have already replaced him? Where’s the respect? Where’s the loyalty? I think he has been influenced by some corrupt politicians.” Alejano told reporters on Monday.